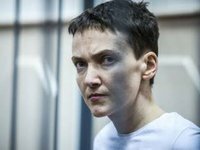 The issue of the release of Ukrainian pilot and parliamentarian Nadiya Savchenko has been resolved politically, Nikolai Polozov, a lawyer for the Ukrainian, said. "Bearing in mind the statements made by officials, President Putin, Federation Council Speaker Matviyenko, the issue has been politically resolved [...] I hope the Kremlin has made a general decision, it's another issue how long it will last," Polozov said on Channel 5 television. The lawyer said that "the main issue now is within what kind of period of time Nadia Viktorovna will be released, whether Russian bureaucracy will create any obstacles, or if everything will happen fairly quickly and will not last for months, years, as normally happens in such extradition procedures according to the Convention." He assumed that Russia would like to trade Savchenko's release for the weakening of the sanctions against Russia, "and the so-called exchange for Russian military men Alexandrov and Yerofeyev is just a cover for agreements between Putin and the West, not Ukraine."